Icebolethu Win A Car Competition! This year we are celebrating 10 years of serving customers with excellence and care. 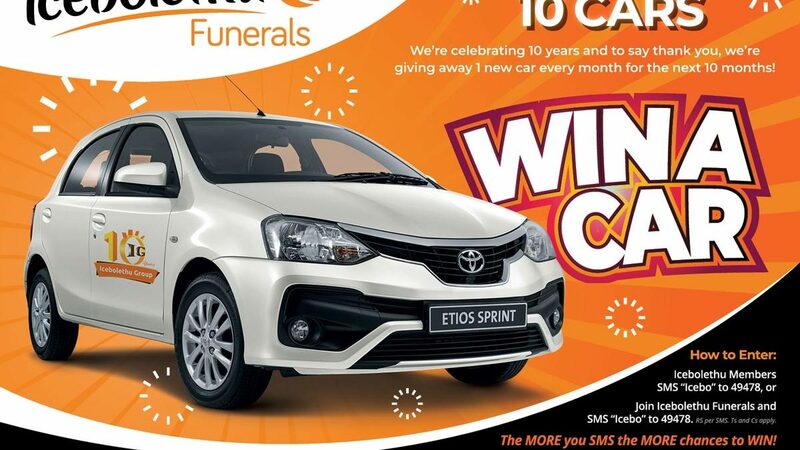 To say thank to our customers we are giving away 10 cars! 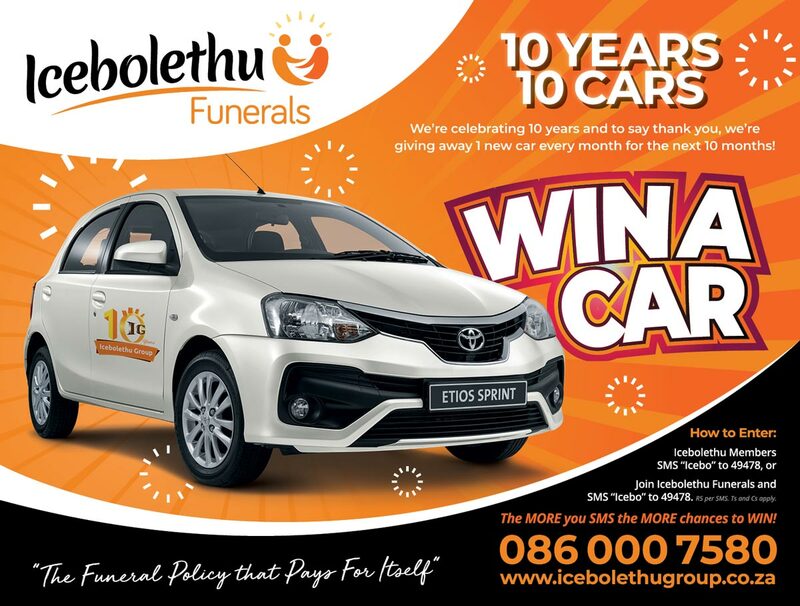 – Join Icebolethu Funerals and SMS “Icebo” to 49478. The MORE you SMS the MORE chances to WIN!! The promoter is Icebolethu Group (Pty) Ltd [Reg no. : 2015/250856/07] (“the Promoter”). The competition will run from 15 March 2019 to 6 December 2019. Participants must be 18 years or older. Existing members enter by SMSing “Icebo” to 49478. New clients enter by joining, pay the premium and SMS “Icebo” to 49478.
prize will be forfeited and another winner will be selected in accordance with the rules. The promoter will only provide a car to the winner, the winner will be required to pay for their own car insurance, fuel and all other expenses pertaining to maintaining the car. The cars will be branded with the wording of Icebolethu Group’s choosing, the winner is to keep the branding on the car for 12 months from the date they receive the car. Participants can only win once, the winner is not allowed to enter the competition again once they have won one of the cars. Confirmation of entry will be by way of SMS. No incomplete or corrupted entries will be accepted. Entries will only be accepted if they comply with all entry instructions. The Promoter reserves the right to use the images taken of the winner for publicity purposes in any manner they deem fit, without remuneration being made payable to the winner. However, the winner has the right to object to these images being used by written notification to the Promoter at Icebolethu Group(Pty) Ltd, 109 Clark Road, Bera, Durban, 4001 Att : Legal Department. The participant’s policy must be in good standing to qualify. acknowledge that they will have no recourse against the Promoter or its agents. In the event that the prize is not available despite the Promoter’s reasonable endeavors to procure the prize, the Promoter reserves the right to substitute prizes of equal value. The more you enter the more chances of winning.